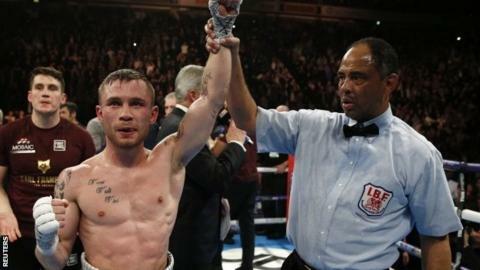 Carl Frampton says he is ready to "move on" after being stripped of the WBA world super-bantamweight title he won by beating Scott Quigg in February. The Belfast boxer, 29, outpointed Quigg in a unification fight in Manchester to add the WBA title to his IBF belt. Frampton had been ordered to defend his WBA title against Guillermo Rigondeaux by 27 July but looks set to fight Leo Santa Cruz for his featherweight crown. "It's disappointing to have the title taken away but that's boxing," he said. "The world hasn't come to an end and my career continues to move in the right direction. In boxing, you can't get away from the politics of the sport," Frampton added in the Sunday Life newspaper. Frampton's manager Barry McGuigan had consistently ruled out the Cuban Rigondeaux as a possible opponent, while saying a showdown with Mexican WBA featherweight champion Santa Cruz was an "obvious fight". Showtime indicated last month that Frampton and Santa Cruz have "agreed to a championship match-up to be scheduled for late summer". "Talks are ongoing for a fight between me and Leo Santa Cruz and that would be massive," added Frampton. In a statement issued on Friday, the WBA said: "In light of Frampton's announced intention to face an opponent other than his mandatory, and for failing to respond to WBA inquiries as to his intent, Frampton's recognition as champion is removed."